The newest Mystwood Chapter, Mystwood: Albion runs events at a 280 acre event site bordering the majestic White Mountains of New Hampshire. The game is set in Albion, the island kingdom across the Narrow Sea from Navarre, inspired by the history and mythology of real world England, Wales, Scotland and Ireland. In this Live Action Role-Playing (LARP) game characters fight for queen and country, and sometimes riches, as they embark on a quest to quell an uprising of the Picts of the north. The Chronicles of Albion are run jointly by veteran LARPer Townsend Thorndike and Emmy Simmons. 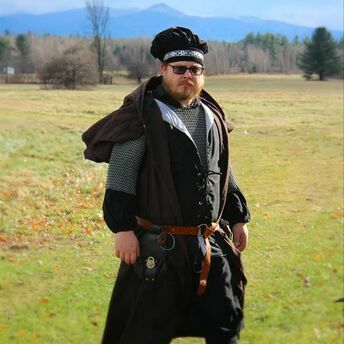 Townsend Thorndike was invited to a LARP in Massachusetts in 2014, and he has been hooked ever since. Always an avid roleplayer, Townsend has been involved in historical reenacting, Dungeons and Dragons, and online roleplaying communities. In 2016, he fell in love with the immersion offered by the story, lore and politics of Mystwood's world. Originally from the distant land of central New Hampshire, Townsend moved to Maine to work as an international security analyst. His passions are theatrical storytelling and spending time in the beautiful wilds of New England. He is often joined by his daughter, the spriteling princess Alanna Faye. ​Townsend serves as the Game Master of the Albion Chapter in New Hampshire on his family's farm and is excited to expand the Mystwood universe.